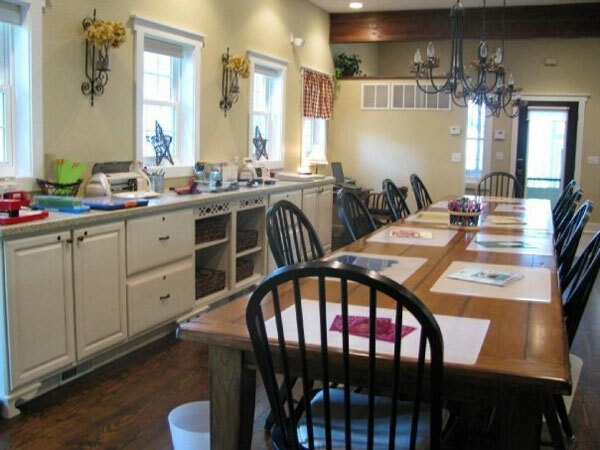 Scrapbookers and Stampers will love the extra large "crop' room” that was designed as the center of the house. 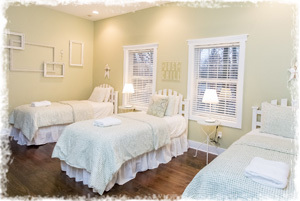 This room includes an enormous table set up for 10, extra large cushioned chairs, professional lighting, personal cutting mats, and personal trash bins. All the equipment and tools are set up and ready for you to use; they include the Cricut, Cricut Explore Air 2, Cricut Cuddlebug machine, and Cricut Expression die cutting systems and cartridges, the Sizzix die cutting system and cartridges, stamps, punches, templates, decorative scissors, paper cutters, light table, embossing system, lap top computer, colored printer, and WI-FI access! 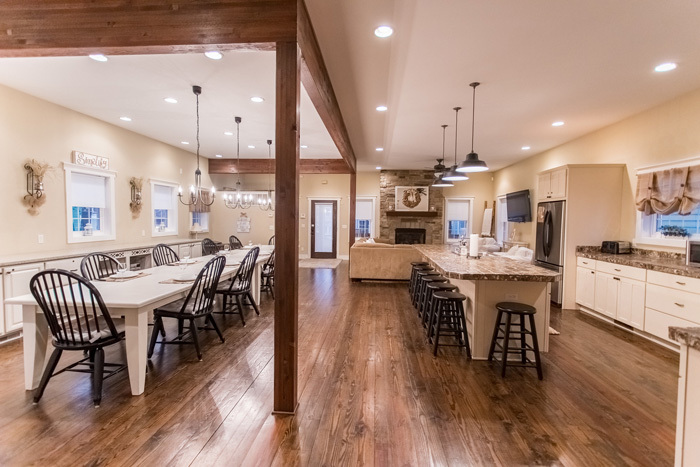 Whether you are working on your pages, reading a magazine in front of the fireplace, or having a snack around the beautiful kitchen island, you and your friends will always be together. 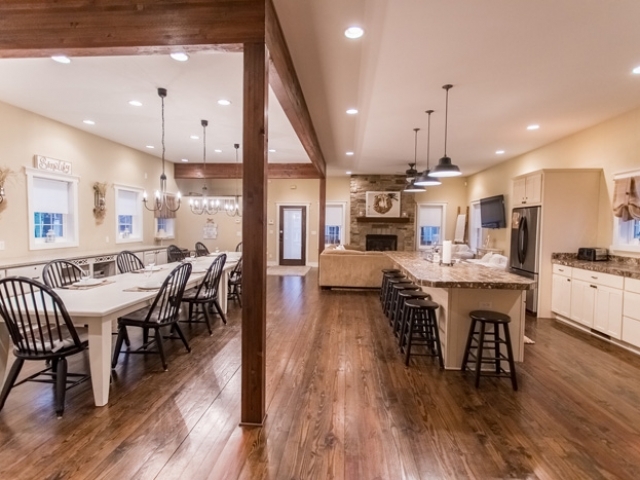 There are no walls, leaving you lots of space to spread out on the main floor of the Cottage. The kitchen is fully stocked with all the necessities and paper goods are provided. 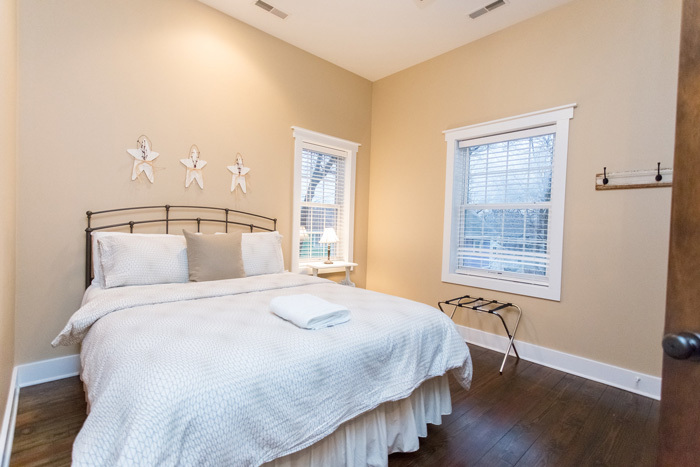 The Cottage is equipped with a flat screen TV, a DVD player, lots of DVDs, and 100's of DIRECTV Satellite music stations. 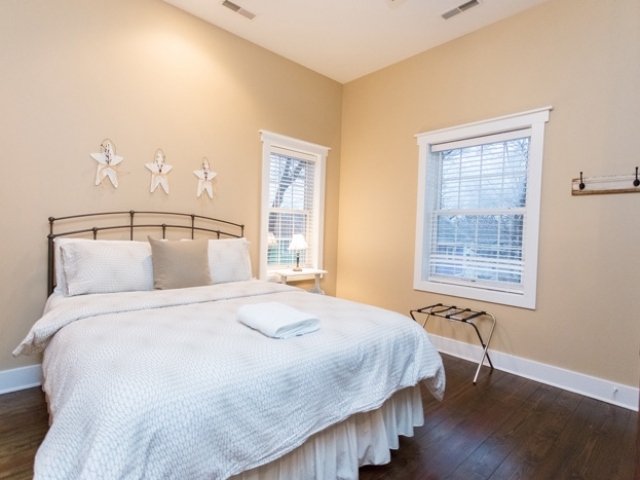 Upstairs, you will find 4 bedrooms - 2 bedrooms with queen beds and 2 bedrooms each with 3 twin beds. Each bedroom is connected by a bathroom that has 2 marble sinks and a luxurious slate shower. All the linens, towels, soaps, shampoo, toothpaste, blow dryer and other bathroom necessities are provided. Want to take a break from working on your pages? 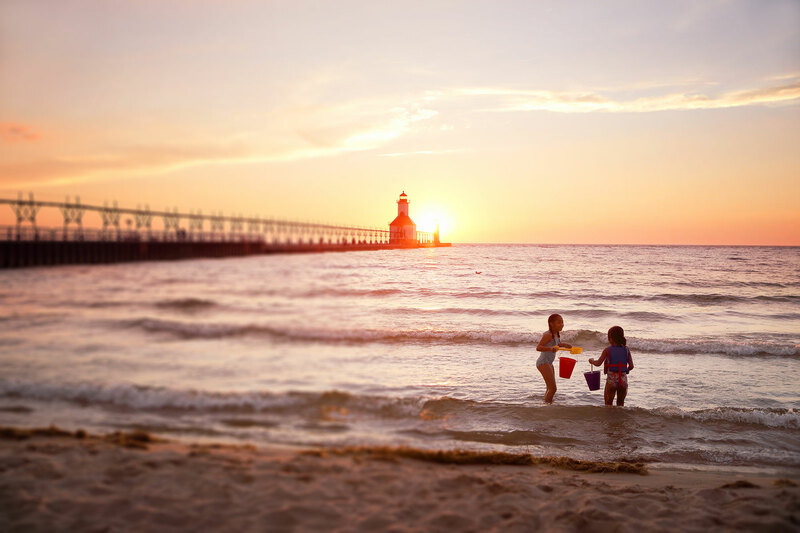 Shopping at the Lighthouse Place Premium Outlet, taking your chances at the Blue Chip or Four Winds Casino, or walking along the beautiful beaches of Lake Michigan are just a few of the options you will have during your stay. Contact us now to learn more of our services. It's time to get away for a weekend with the girls! 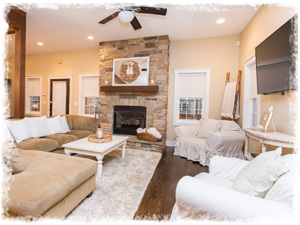 Weekend cottage rental for scrapbooking groups, girl getaways, bachelorette parties, wine tour parties, birthday parties, spa weekends, and much more! The cottage is located in the prestigious and award-winning Beachwalk Resort Community, approximately 1 hour southeast of Chicago. During the summer months, The Cottage is a vacation rental home (check us out on VRBO #1203188 and 1203925). 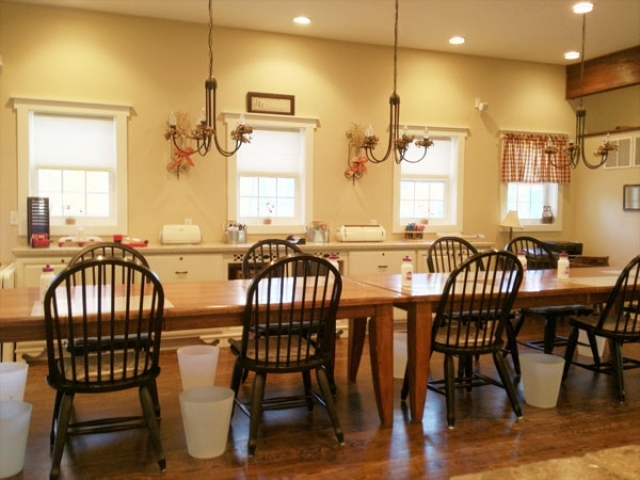 September through May, the property is home of The Croppin' Cottage, a scrapbooking retreat. Just minutes away from The Blue Chip Casino, The Lighthouse Place Outlet Mall, Sheridan Beach, and lots of restaurants. There is always something to do! © 2017 Croppin Cottage Retreat. All Rights Reserved. Sitemap.